Situated in Hanc in the heart of the Poitou Charentes the gite was converted and fully refurbished in 2017. There are two bedrooms (1 king, 1 twin) a large living room with Sky TV and triple sliding doors onto the Garden. The gite is open plan with the living room leading to a fully equipped kitchen diner (washing machine, electric cooker, microwave, dish washer, fridge freezer.) with a central island. Just off the dining area are the double doors eccessing the private courtyard containing another dining are, barbecue, sunshade and sunbeds). For those with young children/babies the gite is equipped with a baby cot, high chair and stair safety gates. There are CO2 and smoke alarms along with a fire blanket and fire extinguisher to ensure safety. For winter lets there are electric radiators and a Burley wood burning stove. All electricity and wood is included in the rate. We are the English owners Pete and Julie and we have lived in France on and off for the last 25 years with Pete doing an awful lot of commuting back to the UK for work. We have brought our two daughters up here and this is the second time we have lived in Hanc (it's a long story!). We knew this property from the last time we lived here and knew it had been up for sale for a number of years and knew that this was a chance to put our stamp on a what was basically then a wreck, although a wreck with potential. We are in the centre of the village but is very peaceful with only the occasional car and tractor passing by. Comfy, modern accommodation and brilliant hosts! If you are looking for a quiet spot, look no further! 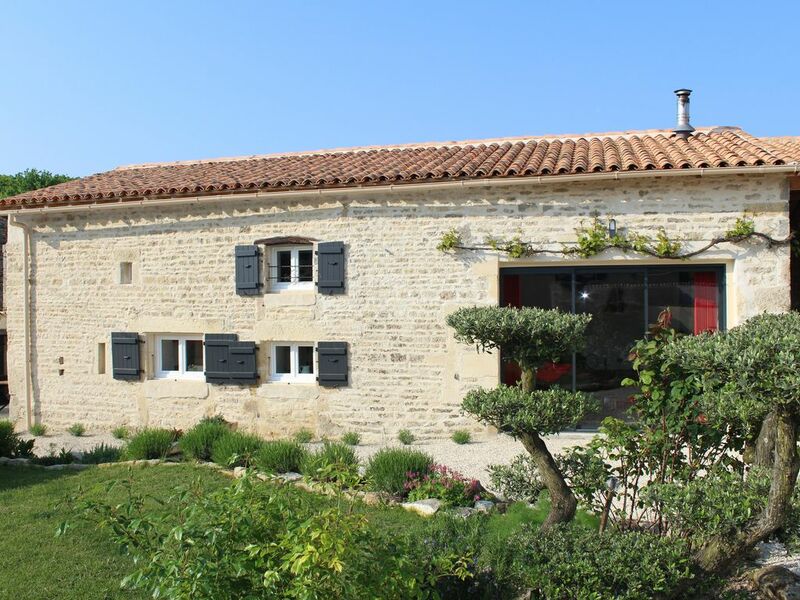 This gite is absolutely brilliant. Modern fixtures and fittings make this the perfect place to escape. The village is very quiet, and although the nearest amenities are about 5 miles, this is a very good place to relax. We really enjoyed our time here, thank you Pete and Julie for making our stay a little extra special! Cheers for that Phil, very kind. We are new to this gîte business so nice to know we are going in the right direction. Pity we can’t offer 14th July celebrations to all our guests! Très beau corps de ferme charentais bien rénové. Bel espace, très bien agencé et très bien équipé.Rien ne manque à la lˋinterieur et la décoration est soignée. Petite cour indépendante avec table, chaises et transats, avec sortie indépendante.Environnement très calme et reposant. Super acceuil des propriétaires, à refaire sans hésiter! Nous sommes heureux que vous avez un bon sejour. Très bon accueil, (bouteille de vin et tomates du jardin pour notre arrivée), le gîte est très propre, décoré avec goût et qualité par les propriétaires, très très bien équipé, literie de qualité. Tout a été pensé pour le confort. On se sent chez soi et nous avons passé un séjour très reposant tout en découvrant une très belle région. À recommander sans hésitation ! Parfait pour une famille de 4 personnes.